In this guide you can find detailed information on how to set the frame rate of your IP camera device. To implement this example, you need to have OZEKI Camera SDK installed, and a reference to OzekiSDK.dll should be added to your Visual Studio project. 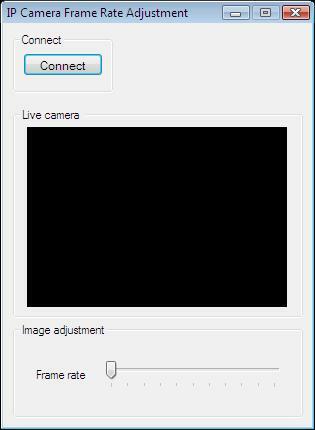 How to set the frame rate of an IP camera device using C#? These methods provide the functionality to initialize the value of the trackbar that you can see on the GUI below, follows all the events belonging to the changes of the camera's attributes and sets the frame rate of the camera using the trackbar GUI element. I tried to give more frame rate value than 24, but it did not work. Why? Please verify what is the maximally allowed frame rate of your IP camera. The example does not check these values so if the provided frame rate is too big it can cause an exception. In this case you should close the application and start it again. I can not adjust the framerate (the slider is not working). Some camera types does not support the frame rate adjustment. Make sure that your camera supports it. The example checks your camera and if it finds that the video encoding is not supported, it disables the slider (you can still move it but there will be no changes happening with your viewport.